You'll be £14.00 closer to your next £10.00 credit when you purchase Luftwaffe Over Germany. What's this? The Luftwaffe over Germany tells the story of one of the longest and most intense air battles in history. The daylight air struggles over Germany during World War II involved thousands of aircraft, dozens of units, and hundreds of aerial engagements. Until now, there has been no single book that covers the complete story, from the highest levels of air strategy to the individual tales of Fw 190s, Bf 109s and Me 262s in air combat against the American bomber streams. This ground-breaking work explores the detrimental effect of Luftwaffe theory and doctrine on the German air arms ability to defend the homeland once the Allied Combined Bomber Offensive began in earnest. By mid-1944, they had lost the battle – but had exacted a terrible price from the Americans in the process. The product of a ten-year collaboration between two noted Luftwaffe historians, this work fills a major gap in the literature of World War II. The authors have examined original war diaries, logbooks, doctrine manuals, after-action reports, and interviews with many combat veterans to produce a richly detailed account. Illustrated with nearly two hundred photographs, as well as new maps and diagrams, this is the standard work on the subject. This book has a ton of information on the daylight defence of German skies during World War II. The authors toiled ten years to bring this excellent history to us. It is filled with facts and figures, but also has 160 photos and numerous maps and diagrams. 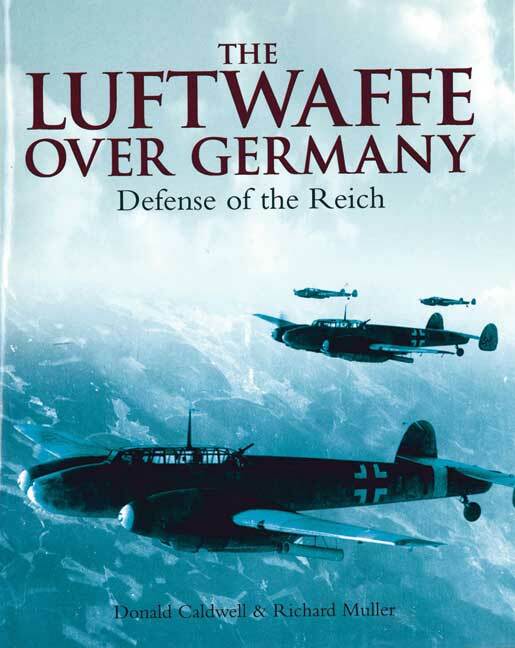 Don Caldwell and Richard Muller have managed to compile a wonderful book on the Luftwaffe’s WW2 operations (German Air Force) and its struggle to defend Germany from the Allied bomber attacks. The book has a very concise sequence of topics and therefore also greatly enhances the option to ‘look up’ particular periods or events. The 160 photos included show many aspects of the battle from the German side, and quite a few were new to me! There are always two sides to a conflict and I feel the allied side of WW2 has been more thoroughly documented than the German/Italian side so this book is a welcome addition to ‘the other side’ of the story. The book has been excellently researched and I particularly like the appendices that include such interesting parts as the day-fighter order of battle, a very extensive list of used sources and a good index. A guarantee for many nights of interesting reading! If you are looking for a fighting chance of understanding any battle or campaign it is essential to view the battlefield from both sides. In this case, the battlefield is the airspace over Germany. This book is a well researched, well illustrated and therefore, comprehensive account of the air war over the Third Reich. A recommended read for those interested in the Bomber offensive in particular. Don Caldwell and Richard Muller have managed to compile a wonderful book on the Luftwaffe's WW2 operations (German Air Force) and its struggle to defend Germany from the Allied bomber attacks. The book has a very concise sequence of topics and therefore also greatly enhances the option to 'look up' particular periods or events. The 160 photos included show many aspects of the battle from the German side, and quite a few were new to me! There are always two sides to a conflict and I feel the allied side of WW2 has been more thoroughly documented than the German/Italian side.... of course the conqueror of any conflict defines the documentation and history of it. So this book is a welcome addition to 'the other side' of the story. Not only does it clearly show what the Germans were doing and planning in order to try and win their war, it also shows why they ultimately failed. Through the stories of the various defense actions and systems, one also gets a good look at the allied bomber offensive, that the Luftwaffe was ultimately trying to stop. Of course there is much more to be told about the German air force than covered here, but the subtitle of this particular book is 'Defense of the Reich', and so the emphasis is clearly on that particular task. Which was a huge task at that and as we now all know, impossible to succeed in. The book has been excellently researched and I particularly like the appendices that include such interesting parts as the day-fighter order of battle, a very extensive list of used sources (where I already found some more interesting books) and a good index. A guarantee for many nights of interesting reading ! Donald Caldwell is a retired research chemist. For the past 25 years he has researched archival sources and interviewed veterans, primarily from the Luftwaffe. His first book, JG 26: Top Guns of the Luftwaffe, has been followed by four others on the Luftwaffe: all have won critical and popular acclaim for their accuracy, objectivity, and readability.